BioMEMS: abbreviation for biomedical microelectromechanical systems. 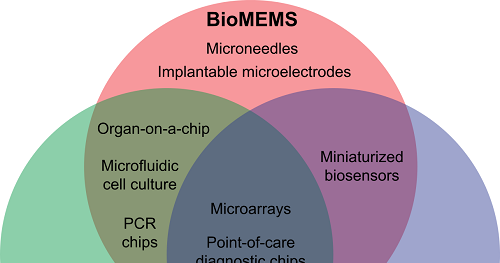 Bio-MEMS is sometimes considered synonymous, with lab-on-a-chip (LOC) and micro total analysis systems (μTAS). Bio-MEMS is typically more focused on mechanical parts and microfabrication technologies made suitable for biological applications. There are currently no items matching "BioMEMS".